* Barack Obama, in Jerusalem, March 21: “I honestly believe that if any Israeli parent sat down with those [Palestinian] kids, they’d say, ‘I want these kids to succeed.’” ... Very true. But how does the other side feel about Israeli kids? * Britain’s Mail: “Hooded, hanged and left in agony for hours on end: Palestinian security chief tells how he has tormented ‘suspects’ with MI6’s knowledge – and reveals how Britain helps pay for it with £33m foreign aid. * Documented cases of torture by the Palestinian Authority rose from 112 in 2012 to 160 cases last year. Very true. But how does the other side feel about Israeli kids? Consider that the most revered parent in Palestinian society is Mariam Farhat of Gaza. Her distinction? Three of her sons died in various stages of trying to kill Israelis — one in a suicide attack, shooting up and hurling grenades in a room full of Jewish students. She gloried in her “martyr” sons, wishing only that she had 100 boys like her schoolroom suicide attacker to “sacrifice . . . for the sake of God.” And for that she was venerated as “mother of the struggle,” elected to parliament and widely mourned upon her recent passing. So much for reciprocity. In the Palestinian territories, streets, public squares, summer camps, high schools, even a kindergarten are named after suicide bombers and other mass murderers. So much for the notion that if only Israelis would care about Arab kids, peace would be possible. That hasn’t exactly been the problem. Israelis have wanted nothing more than peace and security for all the children. That’s why they accepted the 1947 U.N. partition of British Palestine into a Jewish and Arab state. Unfortunately — another asymmetry — the Arabs said no. To this day, the Palestinians have rejected every peace offer that leaves a Jewish state standing. This is not ancient history. Yasser Arafat said no at Camp David in 2000 and at Taba in 2001. And in 2008, Prime Minister Ehud Olmert offered a Palestinian state on all of the West Bank (with territorial swaps) with its capital in a shared Jerusalem. Mahmoud Abbas walked away. In that same speech, Obama blithely called these “missed historic opportunities” that should not prevent peace-seeking now. But these “missed historic opportunities” are not random events. They present an unbroken, unrelenting pattern over seven decades of rejecting any final peace with Israel. So what was the point of Obama’s Jerusalem speech encouraging young Israelis to make peace, a speech the media drooled over? It was mere rhetoric, a sideshow meant to soften the impact on the Arab side of the really important event of Obama’s trip: the major recalibration of his position on the peace process. Obama knows that peace talks are going nowhere. First, because there is no way that Israel can sanely make concessions while its neighborhood is roiling and unstable — the Muslim Brotherhood taking over Egypt, rockets being fired from Gaza, Hezbollah brandishing 50,000 missiles aimed at Israel, civil war raging in Syria with its chemical weapons and rising jihadists, and Iran threatening openly to raze Tel Aviv and Haifa. Second, peace is going nowhere because Abbas has shown Obama over the past four years that he has no interest in negotiating. Obama’s message to Abbas was blunt: Come to the table without preconditions, i.e., without the excuse of demanding a settlement freeze first. Will it endure? Who knows. But when an American president so sympathetic to the Palestinian cause tells Abbas to stop obstructing peace with that phony settlement excuse, something important has happened. Abbas, unmasked and unhappy, knows this better than anyone. You try your best to avoid being violent,’ the Palestinian security man tells me. ‘But in cases where the data is strong, and the prisoner is not co-operating, and when there might be harm done to others – then you must be. ‘I’m not going to lie to you. Torture is used. We have to protect our people. ‘So if he takes the cigarette, psychologically you are the master. You have to prepare him mentally to make his confession. ‘But some have been trained to resist. We have found a lot of booklets telling the fanatics how to do this: how to cheat the investigators. Torture is not the first step and it only happens when we have concrete information about the prisoner’s dealings. ‘If you are not sure of the case, I assure you, torture is not going to be used. But if you feel you’re not getting what you want – well, then the decision will depend on the investigator’s patience and the importance of the information he needs. It was given to me last week in a dusty Palestinian city. Across the table was a well-dressed, middle-aged family man with an infectious smile – a former PA official. He spoke only on the strictest condition of anonymity as he feared becoming a torture victim himself should his identity become public. But he wanted to speak out because he was sure that the ends – a Palestinian state and the defeat of extremism – justify the means. But perhaps the most shocking revelation is that torture sessions still being perpetrated by his former colleagues are financed with Britain’s help. Our taxpayers give £33 million direct to the PA, while £53 million is donated by Britain for various aid projects – more UK aid per head than we give any other nation. Then again, Britain’s Secret Intelligence Service, MI6, which has officers based in Jerusalem, works closely with the Palestinian agencies that carry out the torture, seeing them as sources of valuable intelligence. The UK also provides and pays for the training of middle and senior ranking officers from every PA security agency, including the General Intelligence Service or Mukhabarat, the Preventive Security Organisation, Military Intelligence and the ordinary police force. Ironically, the training includes courses on the need to respect human rights and the rule of law. ‘Yes, the British are very interested in human rights,’ adds the Palestinian security man. Just what ‘it’ means was described by a very recent victim, a professional man in his 40s who was freed without charge two weeks ago after more than a month in Mukhabarat detention. ‘For most of the time I was held, they gave me shabeh every day,’ he says. ‘Always I was hooded, and sometimes they tied my arms in front of me and attached me to the wall, leaving me like that for long, long hours, on tiptoes. You have pain in the arms, in the legs and in the body, and swelling in your muscles. Often I could also hear screaming from the prisoners. ‘But it was worse when they suspended me with my arms tied behind me. Your body is curved, like a banana. Most of the time they do not let your feet touch the ground.’ He showed me his arms and hands – they were still puffy and swollen. ‘During the shabeh, they looked much worse,’ he added. But the former PA official insists that if radical groups such as Hamas were not tightly controlled, they might try to seize power, as they did in 2007 after months of bloodshed in the Gaza Strip. If they began to mount terrorist attacks against Israel from the West Bank, then the Israelis would take matters into their own hands – so ending any hope of creating a fully fledged Palestinian state. A few days after meeting the security man, I travelled to the courthouse in Jericho – supposedly a showcase for UK-funded PA justice. The Department for International Development (DFID) website says Britain will spend £2.2 million this year on a project to ‘strengthen central accountability and oversight of the [PA] security sector’, while developing the rule of law in Palestine is one of British aid’s principal goals. Sitting on a bench in the crowded hall was Khalil Fanouneh, 61, from Hebron, a city in the West Bank. Khalil said his son, Maher, 38, a paint salesman, had been arrested by the Mukhabarat on February 24. Khalil showed me two documents signed three weeks ago after court hearings by Judge Raghda Qawasmi. Both were orders for Maher’s release, together with comments from the judge that the Mukhabarat’s lawyers did not have evidence to support their claim that he was a member of an extremist militia. A few minutes later, Maher’s case was called. Tall and skinny – Khalil said his son has lost a lot of weight – he was led into the dock from a side door in the court. He was wearing a filthy striped kaftan and looked exhausted, his face hollowed out. Ahmad Toubasi, the court’s chief judge – aware the room was filled with clean-shaven Mukhabarat agents in dark, shiny suits – looked scared and horrified. ‘You tell your lawyer about the torture,’ he said, motioning to the guards to remove the prisoner. Maher’s case is far from exceptional. The ICHR has documented 87 instances in the past three years where a judge’s release order has not been obeyed. It suggests the millions being spent by DFID is simply being wasted. ‘Under the PA constitution, this is a crime, and the agency heads could be charged,’ said the ICHR’s Ms Siniora. ‘This has never happened.’ In fact, Maher is one of at least 11 men from the same area who have been arrested over the past three months accused of conspiring to kidnap an Israeli soldier. Their lawyer, Suleiman Husseini, said at least four of them had been ‘tortured tremendously, both physically and mentally’. But as with Maher, the Mukhabarat had refused to release them. One of those being held is Tarek Edais, 31, a Hebron accountant arrested on January 7. The wave of arrests in the Hebron area is being mirrored elsewhere. In Biddo, a village in a highly strategic location on the very edge of the West Bank, Hamdi Ali Hmadein, 28, was arrested in possession of a small handgun, and, says his family, subsequently tortured. No other weapons have been recovered. But just as Edais’s arrest was followed by the others in Hebron, so another ten men have been picked up in Biddo – seven apparently because they belonged to the same gym. In the northern city of Nablus, I met a young man who had been repeatedly interrogated, locked in tiny, unfurnished cells and experienced shabeh because of a Facebook posting – an open letter to his late father, a Hamas member, who was killed by the Israelis ten years ago. He had also been on the receiving end of another widely used technique – being told to report to a Mukhabarat office at 9am in the morning, and then kept waiting until evening. Its purpose, it seems, is purely vindictive. Raed Neirat, a professor at Nablus’s main university and the director of a think-tank called the Centre for Democracy, said the targets were usually young people and students, who were sometimes accused of bizarre crimes such as ‘threatening the sectoral balance of Palestinian society’. The results could be devastating: ‘In my class alone, there will be no fewer than ten students each year who fail their exams because they haven’t sat them, having been told to report to the Mukhabarat,’ said Prof Neirat. ‘Their parents have paid for their education, and they have nothing to show for it – they won’t be allowed retakes. ‘No one keeps figures, but sometimes 100 people will be told to show up and wait on a single day. If they don’t go, they will be arrested. And you are paying taxes to keep these guys in business!’ Asked about all these forms of abuse, a Foreign Office spokesman said Britain was committed to helping the PA ‘build the institutions of a future Palestinian state, governed by the rule of law’, and was ‘proud to contribute to efforts to strengthen the Palestinian Authority’. British Consul-General Sir Vincent Fean, who leads Britain’s diplomatic mission to the PA, has raised concerns with President Mahmoud Abbas and the PA prime minister, Salam Fayyad. But there have been no warnings that if the situation does not improve the flow of cash will stop. Mohammed Jamil, head of the UK-based Arab Organisation for Human Rights, which has published several reports on PA abuse, said such visits were futile. ‘They have been going for years, but nothing has changed. 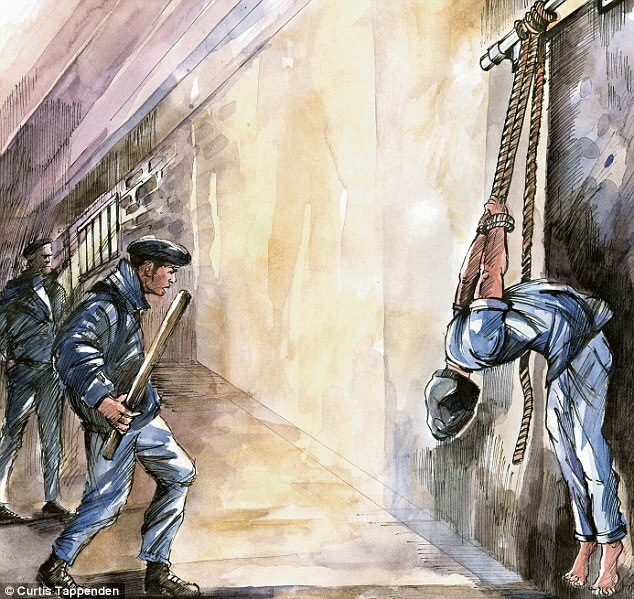 Britain has the power to stop the torture, but it will require much tougher action,’ he said. The ICHR’s Ms Siniora added: ‘There is no doubt things are getting worse. Last year, we inspected one prison where there was clear evidence of shabeh – we saw the hooks on the walls. But as our 2012 report will say when it is published, not one of the cases of torture that came to light has been properly investigated. But PA torture does not often make UK headlines. And liaisons are close between MI6 and the Mukhabarat, the very agency responsible for the worst abuse. The Palestinians have developed crucial sources in places where MI6 cannot easily operate: in the refugee camps of Lebanon and among the ranks of Syrian rebels. After 9/11, sources such as these were invaluable, playing a significant role in defeating Al Qaeda in Iraq. The former official said that Hamas and other militant groups posed a threat not only to the PA and Israel, but to the broader Middle East and the rest of the world.